Have you ever felt the need to get writing instruments which are customized to look just the way you want? Lanier Pens specializes in manufacturing exclusive writing instruments which depict your unique personality. The custom made pens are not just known for having a distinct style but also high quality which makes them last longer than regular pens. Your company’s logo or even your name can be engraved on the pen to make it stand out. Lanier can bring out whatever feature you choose to customize your pen. Lanier Pens also specializes in pens and pen stands made from exotic wood. These kinds of pens are perfect for anyone who is looking for something different in order to stand out. 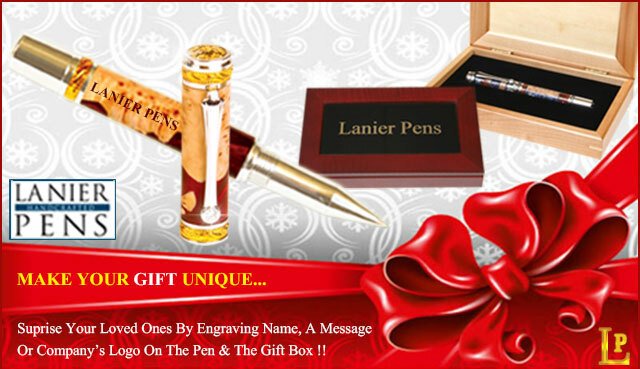 Lanier Pens can take into account your design ideas when creating the custom made pens or stands. If you have preferences in terms of color, shape or size, Lanier Pens- Custom shop will take them into account to come up with a unique and beautiful product for their customer. Even though these customized wooden pens and pen stands are going to cost more than ordinary writing equipment, they are worthwhile because they represent something stylish, functional and beautiful. The pen stands are also available in different shapes and sizes so they can fit different numbers of writing instruments. Lanier Pens is always keen to satisfy customer’s unique requests. In case you have some special needs that need to be fulfilled when ordering your writing instruments, make sure you inform them. The company has skilled craftsmen who have made custom made pens for very many years. Whatever ideas you have in terms of design, feel free to share them with the team at Lanier Pens. They are likely to meet and possibly exceed your expectations.